“There should be legal and political accountability for the involvement of Western countries in this war,” says activist-turned-journalist Farea al-Muslimi. Farea al-Muslimi is a Yemeni activist turned journalist and now a visiting scholar at the Carnegie Middle East Center. In 2013, Foreign Policy named him in its list of Global Thinkers after Farea’s testimony to the US Senate about the effects of drone warfare in Yemen. Farea was in the Yemeni capital Sana in April during the Saudi-led aerial bombardment of the city. I spoke with him from Beirut about the brutal war raging in his country between Houthi rebels and their foes, and the Saudi-led coalition’s campaign to stop the Houthis, who have allied with former President Ali Abdullah Saleh. Laura Kasinof: Western media often portray the war in Yemen as a proxy conflict between Saudi Arabia and Iran. How accurate is that? Farea al-Muslimi: Well, obviously, until very recently it was not accurate at all. However, it is hard recently to eliminate the regional proxy war from what is happening in Yemen. The conflict in Yemen is not rooted in a regional conflict. It exists for domestic reasons and because of domestic actors, but at the same time, it has become a part of a bigger regional war that is not just about Yemen. Can you elaborate about how it has become a regional conflict? Yemen has always been seen as the Mexico of the Gulf, the poor country in the region that no one paid much attention to, even its neighbors. That all changed recently when Iran started to increase its influence in the Gulf’s backyard and started to have direct influence with the Houthis more than in the past. For that reason, Saudi Arabia started to freak out and at the same time the Houthis began provoking the Saudis. It has become a conflict between two powers more than before, which has started to have implications for the entire region. Yemen is just the beginning. How about this idea that sectarianism, Sunni versus Shia, has started to show up in Yemen, since the Houthis are largely Shia, and that sectarianism is a driver of the country’s internal conflict? OK, so this is true if you speak about the war against Al Qaeda. Before September 21 [when the Houthis took over Sana] the war against Al Qaeda was every Yemeni’s war, from the north to the south, east to west. However, now that the Houthis have begun to fight Al Qaeda, it has started to fuel a sectarian war, in a country that was never sectarian. There are people in in central and southern Yemen who were effectively at war with Al Qaeda, but as soon as the Houthis showed up, they found themselves in the same camp as Al Qaeda defending against the foreign invasion of the Houthis from the north. For the first time, this started to give Al Qaeda a lot of environment to find support. You were in Sana during the time of Saudi airstrikes. What was that like? It was a 24/7 nightmare for Yemenis. Also, especially, if you are in the south, in Aden, it’s worse. Even if the bombs aren’t falling, every minute Yemenis are affected, because there are no basic goods. There is no electricity and no water. The country is beaten down. Obviously Yemen has always been poor, and there have been lack-of-resource issues, but it’s like, imagine, someone is falling from the hundredth floor, and suddenly the pace at which he was falling sped up considerably. That’s what it’s like. It’s a truly terrible situation. How are civilians coping with the lack of basic goods? I mean, if you can’t get access to water, you are going to die. Many people have left cities to go to their villages, where they may have storages of goods and can share among families. But now people who are still in the cities are stuck there because they don’t have fuel to leave. And then, of course, there are the people who are now officially refugees. There is war all around in Yemen, even if you are in an area away from the fighting. Food and goods are hard to find, and really expensive when you do. I believe that there has to be a huge movement of people in the coming weeks and months out of Yemen for this reason. Even if the war ends today, it is not going to change this catastrophe. It is an immediate and long-term humanitarian crisis that is being born out of this war that we will see even on an international level. Obviously we know that the United States has played a role in the airstrikes against Yemen, providing intelligence to the Saudis, for example. But what role did the American government and other Western nations play in the lead-up to the war? We shouldn’t forget for a second the role of the international community, because the situation in Yemen now is a direct result of the actions of a number of international players. The situation in Yemen is partly due to the failure of the imposed international peace model in Yemen. That’s one thing. Secondly, it is known that there has been intelligence and logistical support from Western countries for this war, yet there hasn’t been the same sort of response from them regarding the humanitarian crisis. Also, this war violated international law. Direct war crimes have been committed; for example, an IDP [internally displaced persons] camp was hit by a Saudi airstrike. 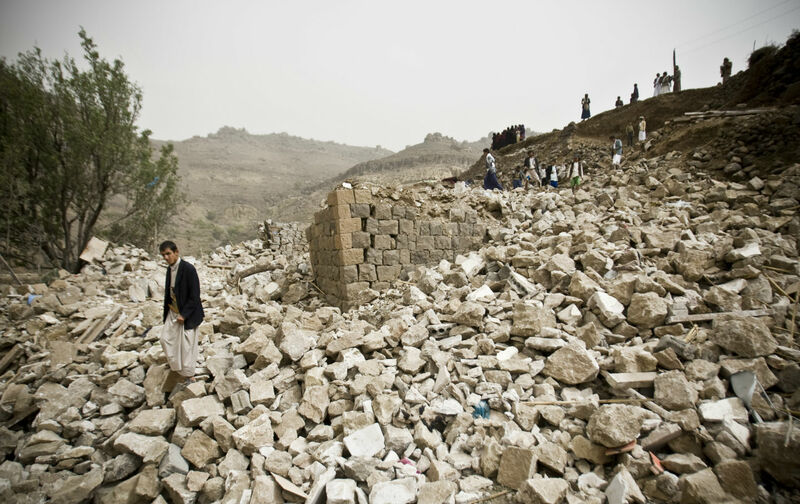 Houthis have prevented aid workers from giving aid sometimes. And also, very importantly, this war has not succeeded in getting the Houthis out of southern Yemen. There should be legal and political accountability for the involvement of Western countries in this war. So obviously, the United States and Saudi Arabia were not fans of the Houthi power grab because of the group’s Iran connections, but as an independent Yemeni, what do you think is so bad about letting the Houthis take over Yemen’s government? The issue is not letting the Houthis have power in Sana if they have it through a normal way. The problem is that the Houthis have committed more injustices against the south and the north than have ever been committed. They are establishing the precedent that if you have more guns, you can do whatever you want, and that is very dangerous for Yemen. It’s terrifying, actually. If you let the Houthis reach power by this war, you will have a standard for Al Qaeda to take control for the same reasons. You are giving credibility to weapons. In Yemen, people don’t dislike the Houthis because of who they are. They dislike the Houthis because of what they are doing. That is happening in the north more than the south. However, their brutality in the south has simply presented them as a group that is destroying national cohesion. So for the sake of Yemen and for the sake of justice, they need to be stopped. Obviously not in this way happening now, but that’s a different topic. If Saudi Arabia stopped its military campaign against Yemen, is it likely that the war would stop? Sadly, there will be many consequences of this war, especially when we are talking about a minimal level of security and political functionality. Yemen will need a long time to get out of this mess. If you have any hope for Yemen’s future, for a stable Yemen, what is it? I still am naïve enough to continue dreaming of a united, democratic, free Yemen, even if not soon. I am not letting that hope go away that easily. Millions of other Yemenis who have seen worse than this still have it too. Laura KasinofLaura Kasinof is the author of Don't Be Afraid of the Bullets: An Accidental War Correspondent in Yemen. From 2011 to 2012, she reported for The New York Times from Sana. She currently lives in Morocco.